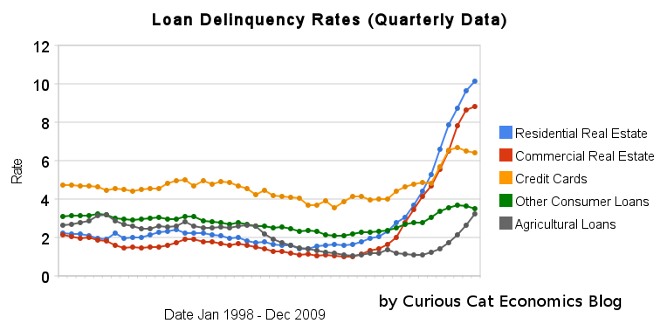 The chart shows the total percent of delinquent loans by commercial banks in the USA. That last half of 2009 saw real estate delinquencies continue to increase. Residential real estate delinquencies increased 143 basis points to 10.14% and commercial real estate delinquencies in 98 basis points to 8.81%. Agricultural loan delinquencies also increased (112 basis points) though to just 3.24%. Consumer loan delinquencies decreased with credit card delinquencies down 18 basis points to 6.4% and other consumer loan delinquencies down 19 basis points to 3.49%. Notes: these data are compiled from the quarterly Federal Financial Institutions Examination Council Consolidated Reports of Condition and Income. Charge-offs are the value of loans and leases removed from the books and charged against loss reserves. Charge-off rates are annualized, net of recoveries. Delinquent loans and leases are those past due thirty days or more and still accruing interest as well as those in nonaccrual status. Charge-offs, which are the value of loans removed from the books and charged against loss reserves, are measured net of recoveries as a percentage of average loans and annualized. Delinquent loans are those past due thirty days or more and still accruing interest as well as those in nonaccrual status. They are measured as a percentage of end-of-period loans.